With tankless water heaters, calcium build-up is much less of a problem than with traditional tank-style water heaters. However, they still need regular maintenance, especially in areas with hard water. Read this guide if you want to learn how to descale a tankless water heater. Don’t worry, descaling your water heater is not hard to do and you can definitely do it yourself. Plain white vinegar will do the job, so there is no need to buy any special cleaning supplies. Furthermore, the whole process shouldn’t take more than 90 minutes. 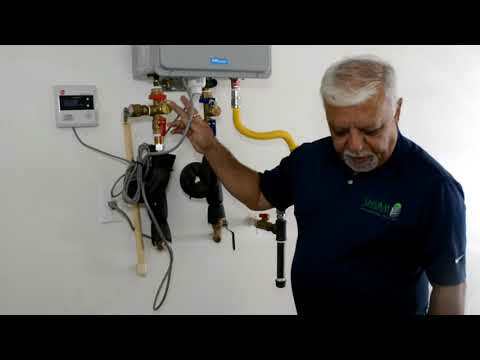 Many of you are probably also wondering how often to descale a tankless water heater. Once a year should be enough. However, if you live in an area with very hard water, you might need to do this more often. Some water heaters will also have an indicator that tells you when the unit needs maintenance. You can buy the hoses, the pump, and the bucket all together in the form of a “tankless water heater cleaning kit.” Buying a tankless water heater cleaning kit is definitely more convenient, but you’ll probably pay less if you buy every item separately. Step 1: Turn off the unit. If you are using an electric water heater, find the electrical circuit for the unit at your breaker panel and turn it off. You should also check if the power is turned off on the unit itself, just to be safe. To do this, you’ll need to access the wiring by removing the cover plate. Take a non-contact electrical tester and hold it against every wire going into the terminal. If it lights up, you haven’t turned off the power completely. Never try to descale your unit without turning the power off! That can cause serious damage to the unit. Step 2: Turn off the water supply valves. You’ll need to turn off both the cold water valve and the hot water valve. The valves are most likely located below your water heating unit. Some heaters will also have a service valve or a draining valve which you can use to drain any water remaining inside. Step 3: Connect the hoses. Step 4: Time for vinegar. Step 5: Turn on the pump. Open the valves for the hot water on your unit and turn the pump on. In many cases, these pumps don’t have an on/off switch. They just need to be plugged into the wall. For this reason, make sure to place the pump into the bucket first and then plug it in. Let the pump run for 45 minutes. When the time is up, turn off the pump. Finally, let the vinegar drain out of the water heater and into the bucket. Step 6: Clean the air intake filter. Step 7: Rinse your water heater. By now, all of the vinegar should have drained out into the bucket. The cleaning process is finished, so it’s time to throw the vinegar away. You should now remove the pump and the hose that was attached to the cold water valve (the hot water hose stays on). Put the cap back on the service valve. Turn on the cold water and let it flow through your unit and into the bucket until the bucket is almost full. (Be sure to turn off the cold water in time, so you don’t overfill the bucket). Step 8: Your water heater is ready to be turned on again. Reattach all of the connections and check if everything is tightened properly. Turn on the power or the gas, and check if the hot water is running again. If you have done everything right, your unit should be working normally. That’s it. Now you know how to descale a tankless water heater.